Throughout their work in the District, Maurice Walters Architects aims their design focus towards sustainability. Throughout their work in the District, Maurice Walters Architects aims their design focus towards sustainability. They obtain a certain reverence for each project’s surrounding urban environment and vernacular. We got to sit down with Maurice Walters himself and learn a bit more about the major influences that shaped Buchanan Park townhomes. Buchanan Park: Tell us a little about your role in the Buchanan Park project. Maurice Walters: We became involved with this project a couple of years ago and since then, we have been shepherding it through its design and approvals and now, the project is under construction. BP: So, as the chief architect of this project, you have a unique advantage in that you’ve lived on Capitol Hill for a long time. How long have you lived here? MW: I first moved to Capitol Hill in 1987 and lived there for a number of years. Then, I went away for graduate school and came back in 2001. I have been living here ever since. So I have definitely spent a lot of time getting to know the neighborhood. I love the character of it, as well as the history, texture and lifestyle in Capitol Hill. 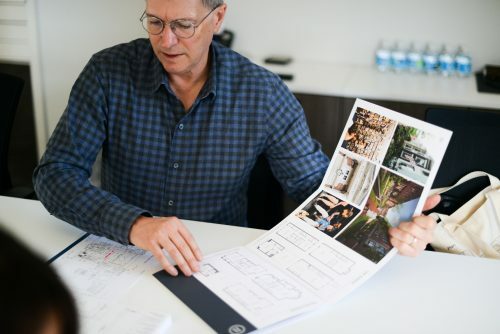 Those are all things that definitely came into play while conceiving, designing, and formulating how the Buchanan Park townhomes were designed.